What happens if my tenant sub-lets or has undisclosed pets? Both would be breaches of covenants by the tenant as set out in the agreement. As with any breach, you or your agent should write to the tenant, remind them that they have broken the terms of their tenancy agreement, and ask them to put it right. Remember to follow up to check that they have done so. This is becoming more common, as people seek an additional source of income. However, many tenancy agreements, and certainly the Finders Keepers agreement, prohibit sub-letting. This is why regular inspections of the property are a must, to ensure the tenant is complying with the terms of the tenancy agreement. Having said that, it’s unlikely that sub-letting would be grounds for eviction: that would be up to the discretion of the Judge, were you to take it to court. Often a conversation with the tenant and a reminder in writing is enough to put a stop to it. There potentially may be more legislation on this in future. We have often come across evidence of pets being kept in rental properties against the terms of the tenancy agreement – cat food hidden in the airing cupboard, for example, or dogs locked in parked cars at the specific time that we have been asked to visit to carry out an inspection. Again, though, in order to evict a tenant for keeping a pet you would have to take them to court and prove that they have broken the terms of their agreement. Even then, the Judge may not agree with you. Talking to the tenant is usually the best way to resolve this problem. In fact, it might be worth deciding to accept pets in your property, although usually pets are prohibited in apartments under the terms of the head lease. As the private rental sector is growing, we are seeing more families with pets applying as tenants. It’s important to take each application on its own merit of course: one cocker spaniel with its owner at home all day is a very different proposition to four German Shepherds with an owner who works full time! 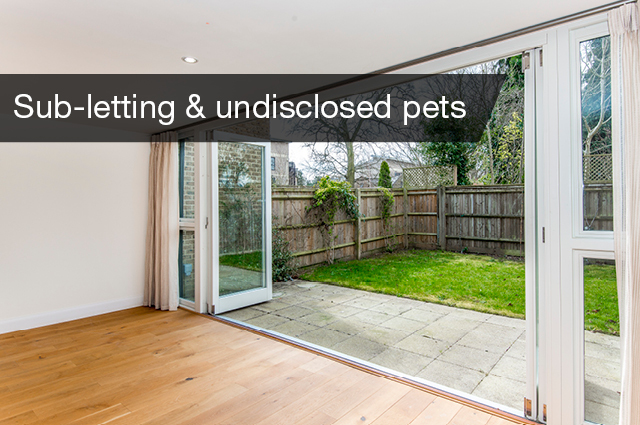 When pets are accepted, we always take a higher deposit and separately negotiate additional clauses relating to cleaning and damage for the tenancy agreement. This is one of the 50 most asked questions in our book: Landlord Intelligence.